Search All of our Midcoast Maine Vacation Rentals here. From Maine Cottage Rentals to Maine beachfront Rentals and everything in between. We are available to assist with all your questions to help ensure you find the vacation rental that is just right for you! Enchanting, quintessential waterfront summer house-beach and wharf. Classic maine summer house on Port Clyde Harbor- a rare find. Outstanding waterfront house- screen porch, granite fireplace, gourmet kitchen. Private and peaceful, located on 3 private acres at the head of Seavey's Cove. Charming lakeside cottage- classic with modern ammenities and touches. 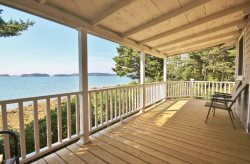 Charming bungalow with stunning views of Penobscot Bay and walk to downtown. Classically elegant in town retreat- a stroll to the harbor and downtown. Ocean front home offering privacy with beach frontage and stunning views. Sitting on Crescent Beach, a traditional, comfortable summer house. Quiet and charming house on the shores of Port Clyde- a walk to the village. Authentic 1940's renovated cottage -an absolute waterfront gem. Classic Maine summer home on bold ocean frontage, large lawn. Stunning antique sea captain's house- village location, luxurious accomodations.